Simple, seasonal classic. Thanks to Delia Smith for the pastry recipe. The, half lard, half butter combination creates that beautiful flaky texture. The tinsel decoration is optional. To our American friends there is no meat in this dish despite the filling being called mincemeat. The mixture is actually chopped dried fruits sugar and spices. Sift the flour into a bowl with a pinch of salt, add the lard and butter in small chunks and rub the fat into the flour until you get fine crumbs. When you get to this stage, add a little water and start mixing with your hand, keep adding a little more water and keep stirring until the dough forms a nice ball. Put the ball of dough in cling film and put in the fridge for 30 mins. Remove from the fridge and cut the dough in half, actually 60% and 40% chunks (one for the base of the mince pies and one for the slightly smaller top.) dust a work surface with flour and roll the larger part out as thinly as you can, and use a 3inch pastry cutter to create the bases of the pies, placing them in a greased pie tin. 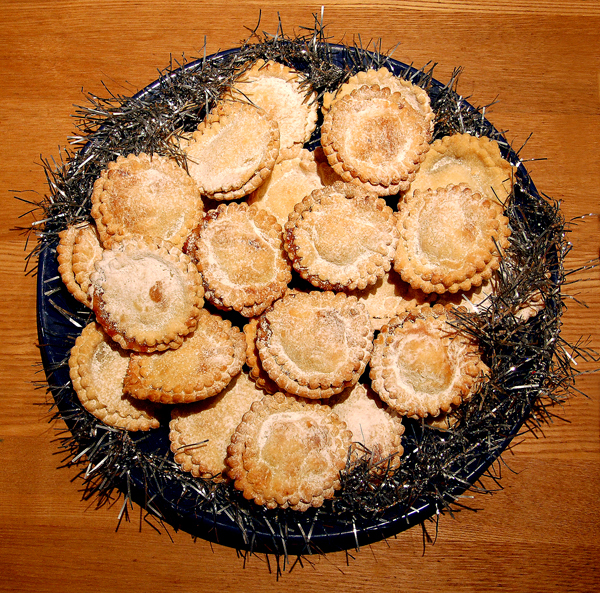 Spoon the pre-bought mincemeat equally into the pastry bases. When that’s done, roll out the other 40% of the dough, again as thinly as possible, then cut the tops of the pies out using a 2½ inch cutter. 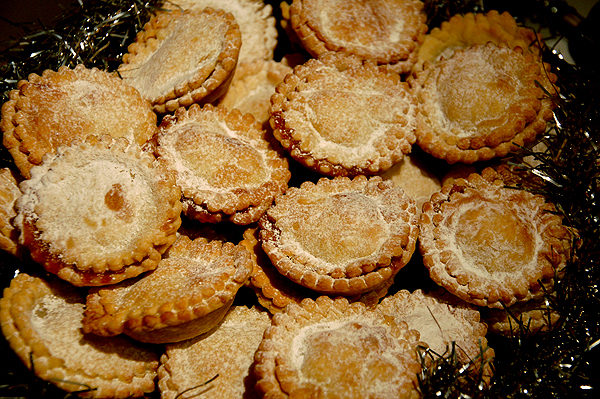 Brush the pies with milk and bake them in a pre-heated oven for 30 mins. Leave them to cool, then dust with icing sugar. Best served at Christmas time with a cup of tea.